Joyce Glasser reviews The Man who Invented Christmas (December 1, 2017) Cert PG, 104 min. At last a Christmas movie and a British writer’s biopic that is entertaining, perfectly cast, and more entertaining than it is worthy and reverential. For anyone looking for authenticity or educational value, Director Bharat Nalluri’s (Miss Pettigrew Lives for a Day) adaptation of Les Standiford’s thoroughly researched book is full of historic touches, worked seamlessly into the biographical details, the characterisations, and into the atmospheric depiction of London in 1843. 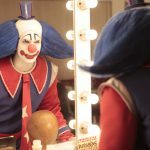 Where Nalluri and scriptwriter Susan Coyne stumble is in the depiction of the writing process – which is the stumbling block of nearly all films about writers. Here, at least, creative writing takes on an imaginative form, with some basis in fact, as reportedly Dickens not only borrowed (as do most novelists) from people in his life but he interacted with his artistic creations that became real in his imagination. Fun as it is to watch Dickens interact with his characters Nalluri goes overboard, turning Dickens into less of a workaholic wordsmith than a psychiatric patient who not only hears voices, but sees their embodiment. Similarly, it is not enough for Scrooge to see the light in the Ghost of Future, Dickens is made to follow suit and come to terms with his nightmares from Warren’s Blacking Factory. His own Christmas joy is dependent on his finally forgiving his father for forcing him to leave school at 12 and work there. 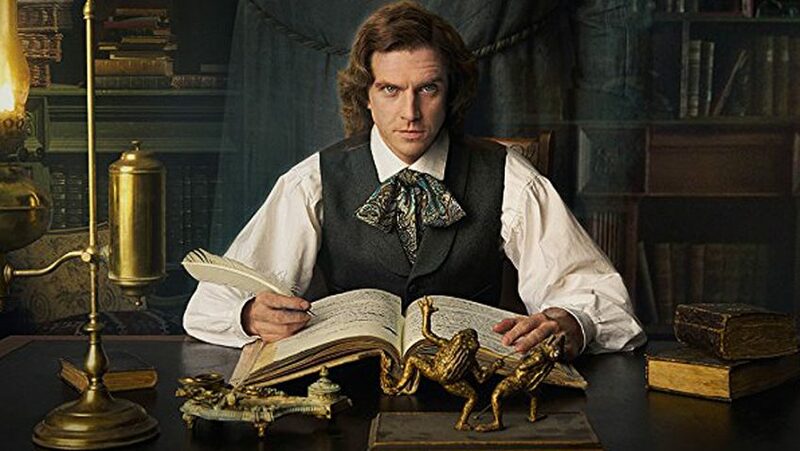 Charles Dickens (Dan Stevens) is 31 and on a high during a reading tour of the USA where women throw themselves at his feet and the men are just slightly more reserved. But 18 months after his return to London, Dickens, who is still haunted by his father’s (Jonathan Pryce) bankruptcy and stint in the workhouse, is worried. His new house is being done up to a high standard, a fifth child is on the way, and, as a visit to his publishers tells us, sales of the last three books (Martin Chuzzlewit, Barnaby Rudge and American Notes) were ‘flops’. (In fact, sales were merely disappointing). Then Dickens comes up with the radical high concept that would result in A Christmas Carol: a Christmas novel in time for Christmas. His publishers refuse to take the risk, not only because Christmas is six weeks away and the book isn’t even written, but because ‘there’s not much of a market for Christmas anymore’. In true Scrooge fashion, they dismiss the holiday as an excuse for employees to have a half-a-day off. With his pride wounded, Dickens defiantly declares he will publish it himself and the rest of the film shows us how he did just that. Coyne does not have to try hard to turn this into a race-against-the-clock thriller, albeit without the villain threatening to kill the hostage or blow up the world. We are nonetheless aware of all that is at stake. The first half of the film is pure bliss as we rush around London immersed in the fabric of 1840’s London, from the depths of poverty and despair to the celebrity hangouts and Dickens’ stately new household awash with drapers and fitters. Nalluri relishes the details of each scene and makes them come alive just as they do in Dickens’ novels. A visit to the dingy office of Dickens’ solicitor (Donald Sumpter) with his trusted friend and unofficial agent John Foster (Justin Edwards) is the occasion for a maggot-infested biscuit with tea. It is also the occasion to hear the news that the defendants the solicitor successful sued on Dickens’ behalf are bankrupt, but his own fee is promptly due. It’s a scene straight out of Bleak House. Equally amusing are the encounters with Dickens’s collaborators – such as illustrator John Leech (Simon Callow) who succumbs to flattery to produce a top quality gilded book – and with his rivals. When Dickens and Foster have lunch at the smoky, ornate Garrick club, novelist (and then, critic) William Makepeace Thackeray (Miles Jupp) congratulates Dickens on having the courage to be ‘out and about’ after his last novel in which ‘not a single character was worthy of appealing to the reader’. The pressure is getting to Dickens, however, and writers’ block sets in just when he cannot afford it. Fortunately, a new children’s maid, Tara (Anna Murphy) is not only literate, but is amusing the children with Varney the Vampire, a little book that Dickens borrows in exchange for a copy of Aladdin (it could be Adam Oehlenschläger’s 1805 theatrical version as Dickens acted in and directed plays). 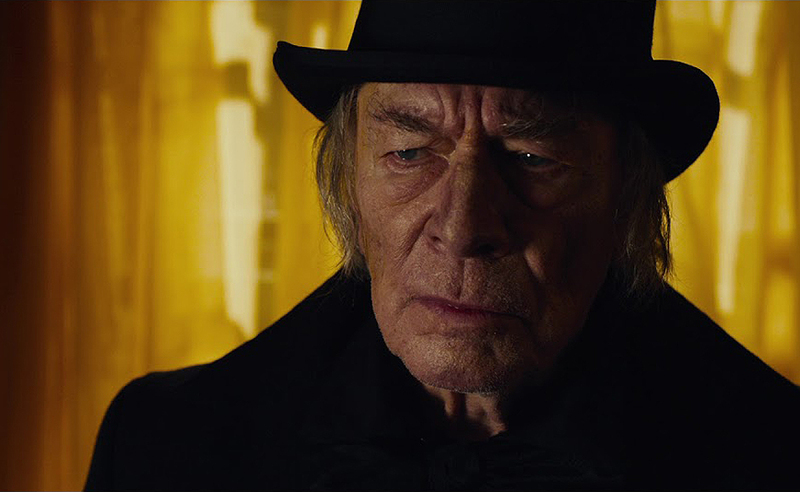 Finding a fitting name for the redeemable villain who, like a stranger Dickens passes in a grave robbers’ cemetery utters ‘humbug’, is hard enough, but dealing with the demanding, critical, and irascible Ebenezer Scrooge (Christopher Plummer) is even more trying. When a relative of the Dickens’ pays a visit to the new house with their disabled son, Tiny Tim is born and Tara – who pleads with Dickens not to kill him off – reappears as the Ghost of Christmas Past. In a case of impossibly bad timing, Dickens’ father, John, (Jonathan Pryce) and his mother (Ger Ryan) show up. Dickens is furious. He had bought his parents a house in Devon and provided them with a pension, in exchange for their absence from his life, but kind-hearted Kate (Morfydd Clark), Dickens’s long-suffering wife, invites them to stay as long as they want. The performances are all top notch. If Stevens gets carried away with his almost one-dimensional portrayal of Dickens as a hyperactive genius, he radiates curiosity and passion and captures Dickens’s ability to find enchantment in everyday life. Coyne’s script is not venerational, however. We are continually reminded of the man’s shortcomings, from his impetuous decision to sack Tara and his hypocrisy about his spendthrift father when he is spending beyond his means, to a plea for charity in the novel that does not extend to his parents (though we can sympathise). 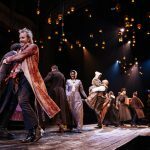 When it comes to giving out supporting actor awards, it will be difficult to omit 70-year-old Jonathan Pryce as the profligate, irresponsible, calculating, yet endearingly vulnerable John Dickens, more a prevaricator than a spinner of yarns like his talented son. But Pryce might find himself facing stiff competition from 87-year-old Christopher Plummer in one of the best roles of his long, illustrious career. His Scrooge is a marvel and his cynicism is as delicious here as Christmas dinner.